The leaves I used in the salad pictured I gathered on our property. They are large by wild standards. I’ve never seen the foot long grocery store version growing on our little farm, but these were tender and mellow. Better than any farm grown, even organic, mixed greens I can buy. I sanitized them really well with grapefruit seed extract that I keep mixed with water. After all, they did come out of the yard. I also made sure that the plants I gathered them from had not started to go to seed. I’m not an expert on wild greens, but I was told by an expert who led a wild herb foraging class I once took to steer clear of plants with dandelion seed heads. I do still love to blow them into air, though, so there will be plenty for early springtime foraging when the weather warms up the following year. The Asian dressing for this salad was not my idea. I was going to use fresh rosemary to make a vinaigrette. An acquaintance, Patti, suggested the Asian dressing. Smart lady. As it turns out, it’s the perfect addition to the orange sections and fresh dandelion leaves and has become one of her favorite salads. But her salad is made with all organic ingredients and Bragg Liquid Aminos in place of soy sauce. Cut the peel from the oranges with a paring knife and section them. 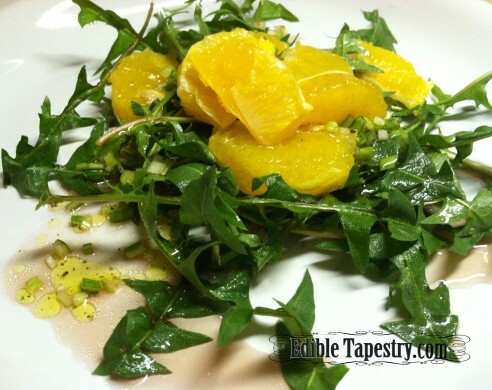 Sprinkle the orange sections over the top of the torn dandelion greens. Mince the garlic and leeks or spring onions. Combine with pepper, vinegar, and soy sauce. Whisk in the oil to make an emulsion. Set aside for several hours to allow the flavors to meld. Drizzle over salad. Makes 2 large servings as a meal, 4 smaller portions as side salad. *I am not nutritionist or an expert on wild edibles. I am not suggesting that anyone take up foraging around their own homes or eat anything that they have gathered from the wild. This blog is simply a journal of my own personal preferences and experiences.